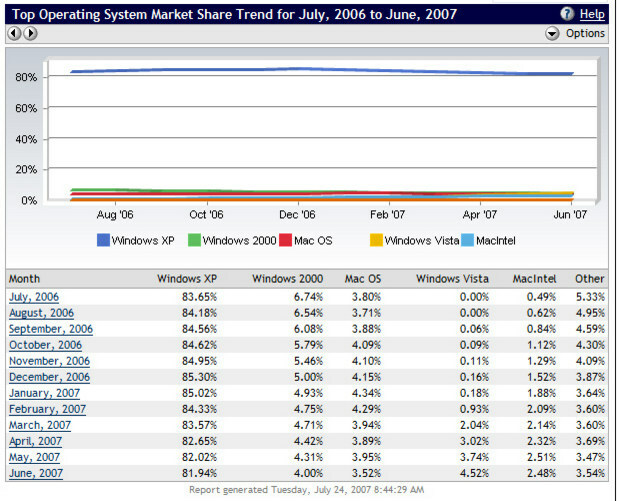 Recent OS market share trends provided by Net Applications reveals that the IT community still favours XP over Vista. Only minor changes in OS’ used by Internet users are registered over the last year. The number of Vista users did not exceed the number of Win 2k users until June this year! It looks like the customers have listened to Gartner and other IT-experts advising their clients to wait until the first service pack for Vista sees the day of light. Despite numerous rumours Microsoft has still not revealed a date for this most needed update. The numbers from Net Applications also shows that the Apple users are slowly moving over on Intel based PC’s. All other *nix users are only referred to as “Others” regardless which distro/version their running.